Do I need hard or soft brown sugar for brownies? How can I recognize if they mean hard or soft brown sugar? And how much of a difference does it make for the completed brownies if I use the wrong type? Should I just adjust the amount of sugar or other ingredients (and if yes, by how much)? Or do I have to try to make a substitution? I found a question which explains how to make soft sugar, but it requires a food processor, and I don't have one. 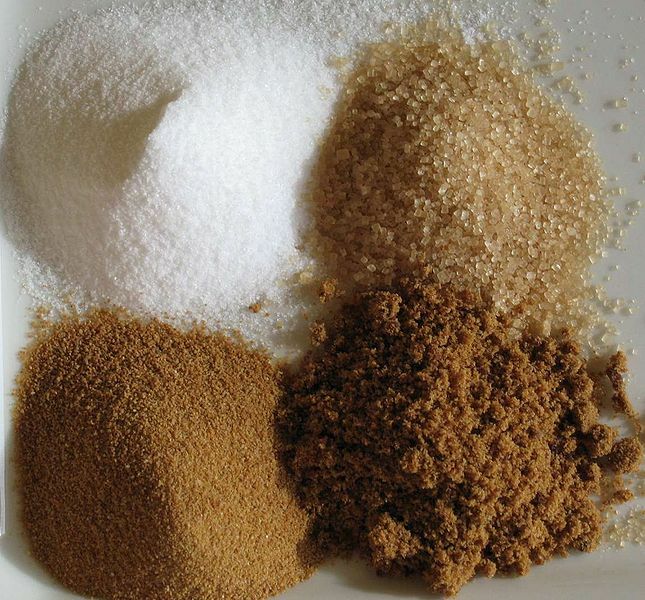 In Germany, the only type found under the name "brown sugar" (brauner Zucker) is the one in the upper right corner. But I have heard that American recipes might need the kind in the lower right corner, which is not normally available here. The in the US, light brown sugar always means the one in the bottom left. The bottom right is dark brown sugar and has a higher molasses content. In the US, I typically see the 'brown sugar' in the upper right referred to as 'raw sugar' or the brand 'sugar in the raw'. If you're using a US recipe, it needs the bottom left. If you don't have any and its an ingredient like in brownies, try adding the molasses and sugar as separate ingredients. 1 Cup of sugar + 1 tablespoon of molasses is about the right ratio for light brown sugar. As Jefromi suggested, brownie recipes call for the sugar found on the bottom of the picture you have added. Probably the lower left one since it's a lighter brown. However if you are unable to get the brown sugar you are able to easily make it using granulated white sugar and molasses by mixing about 1 cup granulated white sugar with 1 table spoon molasses using a fork. Just to add in the Australian terms. Top - white sugar, raw sugar. Not the answer you're looking for? Browse other questions tagged baking brownies brown-sugar or ask your own question. How can I substitute or make soft brown sugar? Is it possible to create this low calorie high fiber brownies? Why are these called “no bake” brownies? Why aren't my chocolate chip cookies coming out the way I'd like them?